This is the most relevant conclusion of a new article published in the journal Science of the Total Environment. 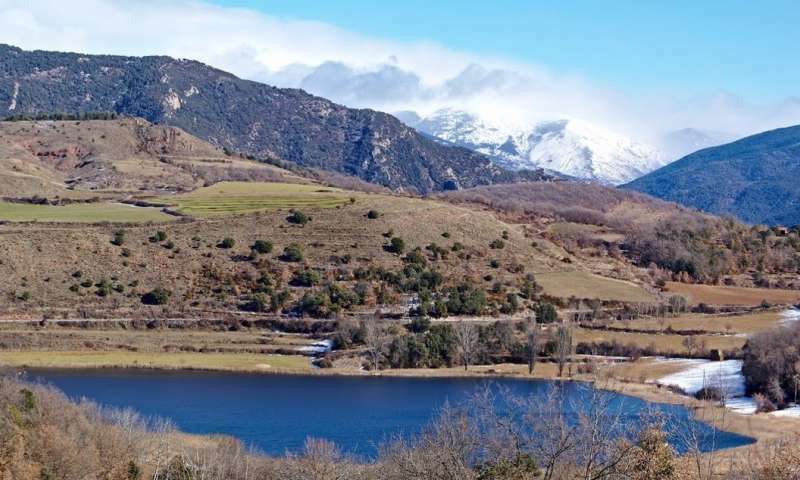 Reconstructing the climate history of the last 500 years with the highest resolution was the main objective of the scientific team, which focused the activity on the lake Montcortès (Lleida), at 1027 meters altitude. This lake ─the only karst mountain lake in Catalonia─ covers an area of 0,14 square meters, and is 30 meters deep. It is integrated in the Plan for Areas of Natural Interest (PEIN) of Generalitat de Catalunya and Natura 2000 network. In particular, the experts analysed the transition of the natural climate variability in the lake from late Little Ice Age –a cold period from mid-14th century- to 21st century. The final objective was to define the features of the climate change in the 21st century and discover the natural or anthropic origin of the phenomena that are related to the climate variability from the last 500 years, a period with anthropic-origin gas emissions from the industrial period that alter the natural climate signal. The experts applied time high-resolution paleoclimatic and paleolimnological techniques, such as the study of varved lacustrine sediments ─a geological file with an exceptional geological value─ and several indicators of deep-water hypoxia levels and the stratification of the water column in the lake. During the last 500 years, several significant episodes of oxygenation in the water masses of the lake have taken place, experts say. "For many years, it was thought that the lake Montcortès did barely undergo oxygenation. It was regarded as a meromictic lake, where deep waters do not mix with surface waters," says the lecturer Teresa Vegas-Vilarrúbia, from the Department of Evolutionary Biology, Ecology and Environmental Sciences of the UB. "Since 1900, human population has been reduced in the town of Montcortès and in Pallars, a contrary tendency to the one shown in populations of other lakes, which are affected by recent anthropogenic-origin hypoxia." This decline of human activities around the lake has been maintained until now and has favoured –among other processes- the reoxygenation of the water column. However, since 1970, oxygenation of water masses weakened again and the presence of sulphur photosynthetic bacteria increased. These are indicators of conditions of hypoxia or lack of oxygen. This process coincides with the rise of the annual maximum and minimum atmospheric temperatures. "Evidence from the last decades –continues Vegas-Vilarrúbia- show that global warming plays a central role in the loss of dissolved oxygen (hypoxia and anoxia) in continental water masses, regardless of whether anoxia has natural causes or derives from human activities (eutrophication, exploitation of hydric resources, etc.). The case of the lake Montcortès is particular and it shows the connection between the current global warming and the loss of dissolved oxygen." At a global level, the future climate scenarios predict a global rise of temperatures, episodes of droughts to be more and more frequent, more greenhouse effect gas emissions and more threats to the preservation of biodiversity. In lacustrine ecosystem, warmer temperatures can cause the loss of oxygen and the stratification of the water column to be intensified, a process that favours conditions of meromixis or waters not intermixing. Regarding the lake of Montcortès, everything suggests it has a good phreatic water nourishment that could make it resistant to the impact of future droughts. However, this could be different in many other mountain lakes of the Iberian Peninsula, where the drawdown could cause changes in the mix regime or even the partial or total drying up in the shallow ones. "A way to reduce the future impact on the lake of Montcortès is to conduct a precise control on the variations of the temperature and oxygenation of the lake and its derived effects. This data would help minimizing the impact and would also help us to control the incorporation of organic matter from the activities that are carried out in the basin," concludes the lecturer Teresa Vegas-Vilarrúbia. The new study, published in the journal Science of the Total Environment, has been funded by the Ministry of Economy, Industry and Competitiveness, within the framework of a project from the R&D National Plan. A good paleoclimatic interpretation of the sedimentary records of lacustrine origins depends on the proper knowledge of the current climatic responses in the lake. According to the experts, determining the elements of the lacustrine systems –benthic or abiotic ones- that respond to the climate change is a challenge. Many elements can respond simultaneously to external factors (pollution, sediment erosion, etc.) and it is usually hard to establish a clear connection between the observed changes and global warming. Also, the non-lineal response from some of these elements towards climate change is adding more complications to the study system. The current episodes of oxygenation in the lake and its relation with the atmospheric temperature over three years in a row have been also gathered in an article by the same scientific team which was recently published in the journal Palaeography, Palaeoclimatology, Palaeocology. The researchers expect to expand the research line with a new project on these processes. The high-resolution study with time indicators, climate records and statistical techniques are certainly well chosen as the methodological elements to help reveal new doubts on the secrets of the past climate in the lake Montcortès.